A day of more Mediterranean conditions combined with bad luck, some bad sailing and some really great sailing. What a day! Despite the Laser Connaught championship this weekend there was still a good supply of regular Lasers (Keane, O’Toole, Walsh), the OK Dinghy and also Richard Tate – that sailor of every class – who was borrowing Alain Deladienee’s Laser. He’s now sailed RS400, Finn, OK Dinghy and Laser in this series, really showing the “mixed” in mixed dinghies. What else can he try? In any case it was a good fleet on a truly glorious day. The first race started with the OK Dinghy putting on a masterful demonstration of how to hold position on the start line. Unfortunately this demonstration took place well after the starting signal. Apparently being in irons is a condition that suits the OK Dinghy. Oopsie! Ultimately Race 1 saw Keane doing a horizon job in his Laser – but only after O’Toole’s dismasting. Race 2 saw a multiway ding-dong battle to the finish and the OK Dinghy came out on top. See below for the detail. O’Toole was clear Race 1 leader in his Laser up the first beat. Keane was chasing hard with Walsh and Sheehy further back. Then Keane tried to start a seaweed harvesting business with his rudder and O’Toole’s mast broke, upending the order. O’Toole was out, frustrated but still determined, and Walsh and Sheehy were back in touch with Keane. Keane recovered and led around the windward mark with Walsh next and the OK Dinghy close behind. Sheehy was swallowed by the IDRAs and their spinnakers and then Walsh discovered why you put a knot in the end of a Laser mainsheet. A race of disasters or mishaps for everyone. And Keane steadily extended his lead. As the race went on Keane just extended more and more, sailing fast and finally leading over the line well over a minute. The OK Dinghy had recovered enough to take second. Race 2 saw O’Toole appearing back on the course with a new rig and a determined look. Now that’s commitment! A tight start on a crowded line saw O’Toole lead initially with Keane and Sheehy next. These two got a puff on the left about half way up the first beat while O’Toole sat in a lull on the right. Sheehy led around the mark only to have Keane sneak inside at the bear-away…it’s becoming his trademark move. Keane and Sheehy extended on O’Toole on the run. The OK Dinghy was trying rather extreme kinetics and if it works it really works. Dramatic hull steering and – essentially – legal pumping. Up the next beat Sheehy and Keane did an imitation of the old America’s Cup racing. Laser and OK Dinghy met and tacked off three or four times before Sheehy’s OK Dinghy sailed into a slight lull and Keane led around the second windward mark by just a few lengths. Tight stuff. O’Toole, Keane and Walsh flew down the final run while Sheehy and Tate didn’t. Keane rounded 10 lengths ahead of Sheehy who now had O’Toole just 2 lengths behind. Keane was forced to loose cover up the last beat until Sheehy and O’Toole obliged by both sailing up the right. 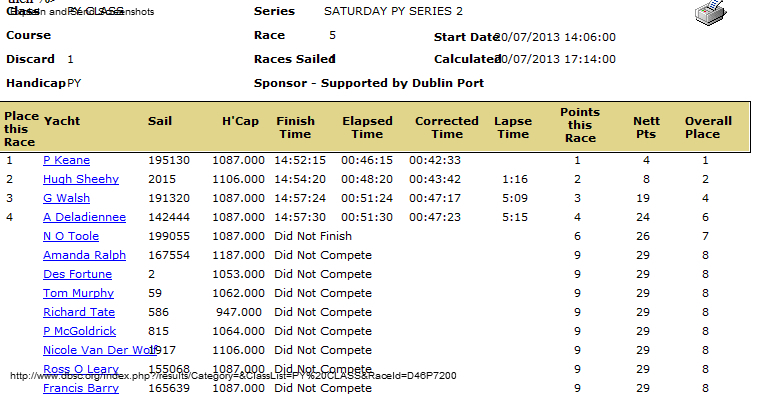 Keane led over the line by 27 seconds….ahead but not by enough… giving the OK Dinghy the win on corrected time. 14 seconds. O’Toole crossed the line seconds after Sheehy, but in silence. OCS in Race 2 and a dismasting in Race 1 making a very bad reward for huge effort on the day. We’ve all been there. It stinks. All in all a spectacular day’s sailing marred somewhat by O’Toole’s bad luck. It wasn’t a day to expect a dismasting.